Finland Center volunteer Henna Hallstrom (L) and treasurer Helena Niskanen (R) at the bazaar table, with Heli Sirvio of the Finnish Church in the middle. The traditional Finnish Christmas Event: bazaar and Kauneimmat joululaulut (the Most Beautiful Christmas Songs) drew approximately 300 Finns and friends of Finland to Greenwich Village on Saturday, Nov. 27. All the Finnish community organizations were represented and everyone enjoyed shopping for Finnish chocolate, liquorice, salmiakki, rye bread, and books for children and adults, as well as many kinds of useful Christmas gift items. Old friends caught up with news while savoring traditional rice porridge in the church parish hall. Then everyone gathered in the church to watch the children’s Lucia procession, performances by talented local Finnish musicians and to sing favorite Christmas songs from Finland, accompanied by organist (and also FCF Music Director) Kalle Toivio. 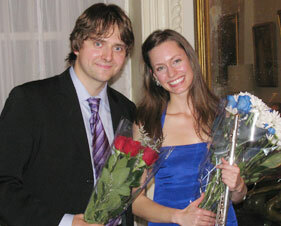 Anna Urrey and Kalle Toivio gave a flute and piano concert on October 27 at the Salmagundi Club. Anna Urrey, who will complete her studies at Manhattan School of Music in the spring, had compiled a program of compositions for flute and piano by internationally known composers as well as the Finnish composer Heino Kaski. She also played several beloved songs by Sibelius, Merikanto and others, arranged by herself for the flute. The concert attracted a roomful of members of the Salmagundi Club as well as Finland Center, and several newcomers. Arctic Jungle Fashion Gala on Sept 29 attracted nearly 200 people and was a resounding success! Details and photos to follow, also on the Arctic Jungle Fashion Gala blog. When I recommend to my fellow Finns to join Finland Center as a paid member the first response is always “Why? How does it benefit me?” Well, by becoming a paid member Finland Center is able to keep renting space from The Salmagundi Club and keep arranging events and free concerts. On August 27th Finland Center hosted a ‘Finntastic Jazz Lounge’ as a joint event with Arctic Circle, Finns of NY. The icing on the cake was jazz singer Tuija Komi, who was visiting from Germany. Watching Tuija perform was an absolute pleasure. She treated us to such gems as ‘Tanssivat Porot’ and ‘I’m Gonna Live ‘Till I Die’ from her CD. Tuija is a very vivacious and personable performer, who really knows how to capture the attention of her audience. She performed for about 30 minutes, and then treated us to an encore. While Tuija was performing, the audience was treated to complimentary platters of cheese, courtesy of Valio. The full service bar not only had Finnish beer, prosecco, and a gracious bartender, but also what might be the cheapest priced wine in Downtown Manhattan! Following her performance Tuija mixed and mingled with the crowd, signing for autographs and posing for pictures. The turnout was good, about fifty people. This was such a fun event, and I’m already looking forward to the next “Finntastic Jazz Lounge”. Attorneys Ceridwen Koski and Amanda Goodman, who specialize in immigration to the US, gave a fact-packed lecture at the Salmagundi Club, followed by answers to questions from the audience. For more detailed information on this interesting topic, check our blog. Later on the same evening, Emma Larsson sang classical jazz tunes by Jobim, Porter, and others from the Great American Songbook, accompanied by Sami Linna on guitar. Both are graduates of the renowned Sibelius Academy in Helsinki. The quiet setting of the Salmagundi parlor made it possible to fully appreciate Emma’s clear voice, Sami’s masterly guitar technique, and the smooth cooperation between the two — something members of the audience commented on afterwards. (“They need to make a CD together!”). For more info, see www.emmalarsson.com and www.myspace.com/samilinna. Otto Tolonen is one of the most successful Finnish Classical Guitarists. He has won prizes and awards in international competitions since 1995. His latest achievements include a first prize in the Anders Segovia Competition in Spain, and a third prize in the Tokyo International Competition, in 2008. In 2009, he came in second in the Guitar Foundation of America International Concert Artist Competition in Ithaca, NY. This year, Otto is competing again in the same competition, this time held in Austin, Texas. En route to Texas, he stopped over in New York and gave a recital on June 19 at the Salmagundi Club. His repertoire is broad, encompassing both old composers such as John Dowland (1563-1626), Alonso Mudarra (1510-1580), and Dionisio Aguado (1784-1849), and modern ones; at this concert these included Denis Gougeon, Georges Auric, Francis Poulenc, Germaine Tailleferre , Darius Milhaud, Gustave Samazeuilh and Joaquin Turina. The intimate atmosphere of the Gallery with its wooden floors provided for a perfect setting and excellent acoustics, which allowed the audience to hear also the softests sounds and intriguing harmonies of the compositions. The audience in New York was certainly impressed with the combination of skill and sensitivity which Otto’s playing demonstrated — we are crossing our fingers for him in Texas! Meritta Koivisto, author of the "London Lover"
A performance of Oliver Messiaen’s Quartet for the End of Time was given at the Salmagundi Club in Manhattan, May 9, 2010 under the auspices of Finland Center. This quartet is perhaps the most well known piece of chamber music written in the last half century or so and considered a masterpiece by those deemed knowledgeable to make such judgments. It was composed by the French born Messiaen while in a prisoner of war camp in Germany during the Second World War. Its first performance, given by him and three other French prisoners, took place at the camp for an audience of prisoners and German guards. Such an arresting history could not have hurt the work’s popularity despite its screechy dissonances, intricate patterns of harmonies, and difficulties for a general audience to always follow its musical progression. Somehow, however, the work exudes a certain authority and demands attention throughout. Especially riveting among its eight movements is part five, Praise to the Eternity of Jesus for cello and piano, a heart-felt piece. Part eight for violin and piano, Praise to the Immortality of Jesus, was of comparable strength of feeling. Many of the sections contain some biblical reference which Messiaen took for his inspiration. The title of the work itself had been taken from a part of the Book of Revelation: That there should be time no longer. It would have been of interest to ask the musicians how much of the religious significance affected their playing, but I didn’t present the query to them. All four young musicians performed this difficult work with relative ease as if they had been performing it all their lives though that would not have been possible. The exemplary artists were Marie Helene Bessesen, clarinet; Alexandrina Boyanova, violin; Elizabeth Means, cello; and Kalle Toivio, piano. I have nothing but praise for their playing. However, some professionalism if not seriousness of purpose suffered during the smiles shared by a couple of the players at various times during the performance. Marie Helene Bessesen completed her Bachelor’s Degree in clarinet at The Royal Danish Academy of Music and is currently pursuing a Master’s Degree with Charles Neidich at the Manhattan School of Music. She’s toured extensively and performed at such venues as the Sydney Operea House, The Danish Radio Conert Hall, and Carnegie Hall. Jaakko Heikkilä photographs people with warmth and empathy. He has long been interested in minorities and small communities and has photographed them in Torne river valley, Russia, Harlem of New York, Armenia, Los Angeles, Venice, Serbia and Brazil. Cosponsored by Finlandia Foundation New York Metropolitan Chapter. 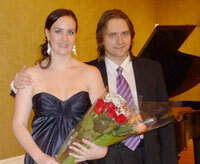 Pavlina Horakova is from Prague, the Czech Republic, and in her last year of studies at the Manhattan School of Music. With her dark and deep mezzo-soprano voice, she gave an outstanding interpretation of songs and arias by Jean Sibelius, Antonin Dvorak, P.I. Tchaikovsky, S.Rachmaninov, Figus Bystry, J.Brahms. K.Weill and L.Bernstein — a concert of Finnish, Czech and Russian music. Finland Center Music Director Kalle Toivio seems as brilliantly capable of the task of accompanist as he is giving a solo piano or organ recital. We look forward to following Ms. Horakova’s career in the future! On Valentine’s Day, the Parlor of the Salmagundi Club in Greenwich Village New York was filled to the last chair as violinist Anna Miritza Lundberg played romantic music suited to the theme of the day. Beginning with Jean Sibelius’ Romance, the music and the intimate setting – with its oriental carpets, 19th century paintings, crystal chandeliers and ornate fireplaces — quickly took the listener back to the 19th century salons. Somewhat familiar, at least to the Finns in the audience, were some of Pablo de Sarasate’s virtuoso tunes, for which he drew inspiration from Spanish Gypsy music. Ms. Lundberg’ spirited playing was matched by that of accompanying pianist Kalle Toivio, who also performed two solo pieces, one being Frederic Chopin’s Ballade in F minor, the other one the Spanish Rhapsody by Franz Liszt. The performers received a standing ovation, and were called back for an encore: Czardas by Monti. We are grateful for the valuable contribution of our Music Director, Kalle Toivio, in arranging this concert as well as many others earlier and yet to be heard; and like some members in the audience specifically expressed to us, we hope to hear Ms. Lundberg again soon in New York. Idée Fixe played a wonderfully inspiring concert at the Salmagundi Club on January 21st. Their bold choices for the program included works by Gabriel Pierne, Lars-Erik Larsson, Vincent Persichetti and Samuel Barber. In addition the audience heard very interesting works by contemporary Finnish composers. These pieces by Kirmo Lintinen and Marko Portin proved that contemporary music in Finland is alive and well and sounds exciting and new at the same time. Many times contemporary music can sound abstract and too theoretical to the listeners, who most of the time do not have the luxury to study the works before the concert takes place. This was not the case in Idée Fixe’s concert. These works sounded fresh and musically alive. Perhaps it is the nature of the combination of the instruments, woodwinds in this case, that gave the clarity and exactness to the execution that made this particular concert such a pleasure to the listener. Kirmo Lintinen and Marko Portin have managed to create music that is at the same time extremely interesting and stimulating to listen to. Job well done! Idée Fixe, whose five members are all members of leading Finnish symphony orchestras, has found something very original in their ensemble, and we could all enjoy the fruits of their efforts in the concert. This kind of musicianship is something worth to preserve and support. It grew out of a need to form a chamber music ensemble from orchestra musicians and has developed into artistically cultivated organism. We wish Idée Fixe succes in their career hope to hear them soon again in New York City.